Media captionTheresa May says there will be no Tuesday vote on her Brexit deal as there is "not sufficient support" for it to be approved. MPs are voting on whether to take control of the Brexit process in Parliament in an attempt to break the current deadlock. They will decide shortly whether to back indicative votes on alternatives to Theresa May's twice-rejected deal. Ministers have urged MPs to "accept assurances" they will be given votes on alternatives anyway. But business minister Richard Harrington quit shortly before the vote to back the cross-party plan. The outcome of the vote on the plan, backed by Labour, the Lib Dems and the SNP as well as some Tories, is expected to be close. Labour withdrew its amendment calling for the government to "provide sufficient parliamentary time this week" for indicative votes. But MPs could still vote on an amendment from Labour's Dame Margaret Beckett, calling for MPs to be given a vote on requesting another extension Brexit if a deal has not been approved by 5 April. Earlier, Theresa May told MPs she did not have enough support to win a vote on her EU withdrawal deal "as things stand". But she insisted she would continue trying to get MPs to back it before putting it to the Commons for a third time this week. The PM is ordering Tory MPs to vote against the bid by a cross-party group of MPs, headed by Tory Sir Oliver Letwin, to hold votes on alternatives to her plan. If passed, the amendment would give MPs the opportunity to vote on a series of options designed to test the will of Parliament to see what, if anything, commands a majority. Ministers saw off a similar attempt earlier this month by MPs to take control of Commons business to consider alternatives to Mrs May's deal by just two votes. The government has said it would give MPs time to hold such votes anyway, but Mrs May said she was "sceptical" about the process and would not commit to delivering the outcome of the votes. Earlier on Monday, DUP leader Arlene Foster told the prime minister that her party had not changed its position and would not be backing her deal. The prime minister said the "default outcome" remained leaving the EU without a deal. "The alternative is to pursue a different form of Brexit or a second referendum," she said. "But the bottom line remains: if the House does not approve the withdrawal agreement this week and is not prepared to countenance leaving without a deal, we would have to seek a longer extension." That would mean holding European elections, she added, and would mean "we will not have been able to guarantee Brexit". She also confirmed that on Wednesday, the government will seek to change the UK's 29 March departure date through a piece of secondary legislation, which will make 11pm on 12 April the earliest Brexit date. But she warned MPs that even if they voted against the change, it would still happen because it was contained in a piece of international law. Media captionJeremy Corbyn criticises the "dangerous and irresponsible" comments from Theresa May about the delay to Brexit. 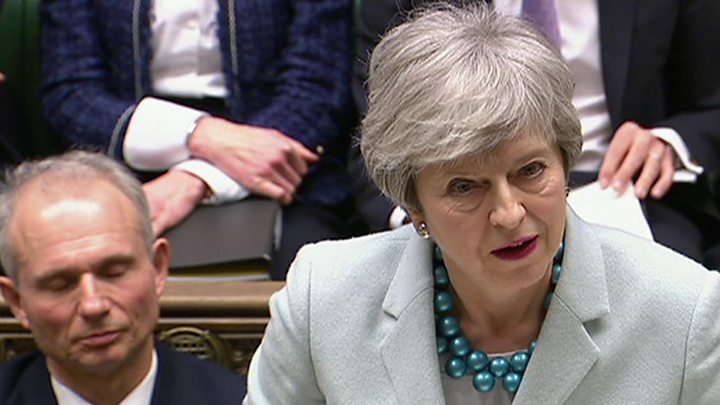 She said the government would provide time for MPs to debate Brexit alternatives but added: "When we have tried this kind of thing in the past, it has produced contradictory outcomes or no outcome at all." "The votes could lead to an outcome that is un-negotiable with the EU," she told MPs. "No government could give a blank cheque to commit to an outcome without knowing what it is." Mrs May's second-in-command David Lidington told MPs the government would arrange indicative votes on Wednesday, if Mr Letwin's amendment is voted down. If it is passed then the timing of any votes would be up to MPs, he added. Asked by Sir Oliver why the government would not simply back his amendment, as it was proposing essentially the same thing, Mr Lidington repeated what the prime minister had said earlier, telling MPs it would "would overturn the balance of power between Parliament and government". 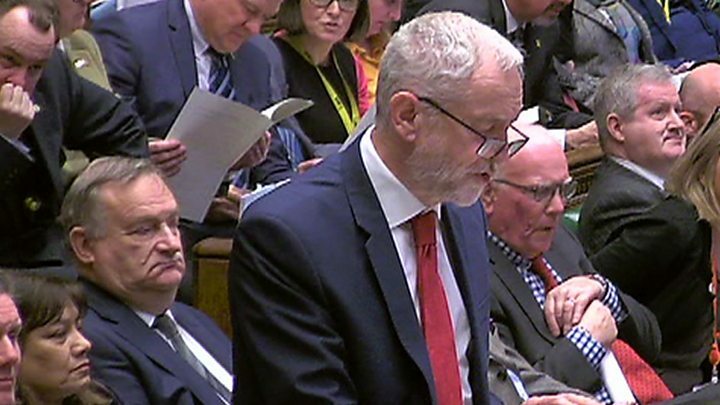 Labour leader Jeremy Corbyn confirmed that his party will back Sir Oliver's attempt to secure "indicative votes" on Brexit, telling MPs: "It is time for Parliament to take control." Sir Oliver said he was not proposing a "constitutional revolution". He said he would vote for the PM's deal but he did not believe there was "a majority in favour of the first preference" of any MP, and it was time to "seek compromise". How likely is it that a handful of ministers might resign tonight to help that theoretical process? Quite likely. Is the prime minister about to get the DUP on board for her deal? Not quite. But the biggest question is, as it always has been - is Theresa May about to seal the deal with the Brexiteers whose votes she so desperately needs? Well, not quite. Mrs May's EU deal has been overwhelmingly rejected in the Commons twice. She has said she would only bring it back for a third Commons vote if there was "sufficient support" for it - and she spent the weekend trying to persuade Brexiteer Tories to get behind it. But many are thought likely to take their lead from the DUP, which has led objections to the Irish backstop clause. Meanwhile, the EU has said all its preparation for an "increasingly likely" no-deal scenario on 12 April has been completed. Media captionTheresa May says she had expressed her "frustration with our collective failure to take a decision" over Brexit. Jeremy Corbyn met the prime minister for over an hour earlier, and had what Labour described as a "frank and comprehensive exchange of views" on Brexit. Mr Corbyn told the PM there was no basis for holding a third vote on her deal. Last week Mrs May was forced to ask the EU for an extension to Article 50 and hundreds of thousands of people marched in central London calling for another EU referendum. Monday: MPs will debate the Brexit next steps and a number of amendments - possible alternatives - to the government plan will be put to a vote. The most important of these is the indicative votes plan. Wednesday: This is when indicative votes would be held - we don't know yet whether MPs will be free to vote how they want or be directed along party lines. The chances of any genuine cross-party consensus being achieved are not high. MPs will also debate and vote on removing 29 March from UK law as the day Britain leaves the EU. Thursday: A possible opportunity for meaningful vote three. The prime minister may hope that Brexiteers will finally decide to throw their weight behind her deal because indicative votes have shown that otherwise the UK could be heading for the sort of softer Brexit they would hate. Friday: This is still written into law as the day the UK leaves the EU. The PM is attempting to change that through a piece of secondary legislation. If she succeeds, the earliest Brexit will happen is 11pm on 12 April. In normal times, the government runs the country and Parliament - comprising all the MPs and Lords who are not members of the government - is there to monitor and scrutinise the way they are running things. The government cannot make new laws or raise taxes without Parliament's agreement. And Parliament can challenge or block many of the decisions made by government ministers. But ultimately it is the elected government that calls the shots - partly because it controls what gets debated in the Commons. 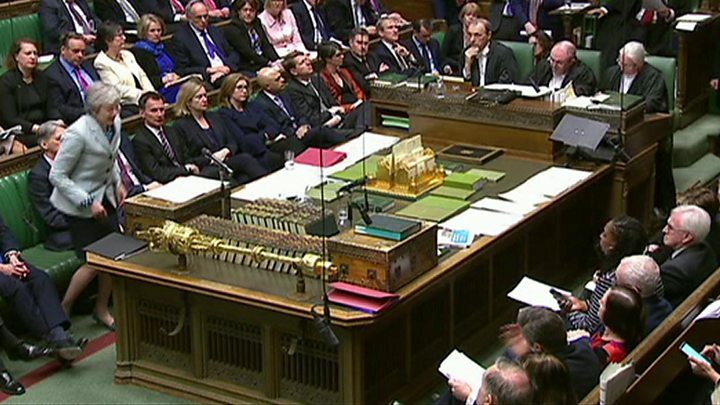 A group of MPs is now bidding to take over the Commons timetable on one day this week, so it can hold votes on alternatives to the government's Brexit plans. The government does not have to abide by the outcome of these votes - and the prime minister has ordered Tory MPs to vote against the move, arguing it would set a dangerous precedent. She says the government will give MPs Parliamentary time to debate and vote on alternatives, in an effort to retain control.